Kanji is said to be the most difficult part of learning Japanese. The most common reasons for this are "there are a lot of them," or "they are complicated," or even "they are hard." But if you know how to learn kanji, it doesn't need to be so hard. You don't need to spend 10+ years studying kanji to reach a decent level of Japanese literacy. One or two years will do, if you've got the right technique. 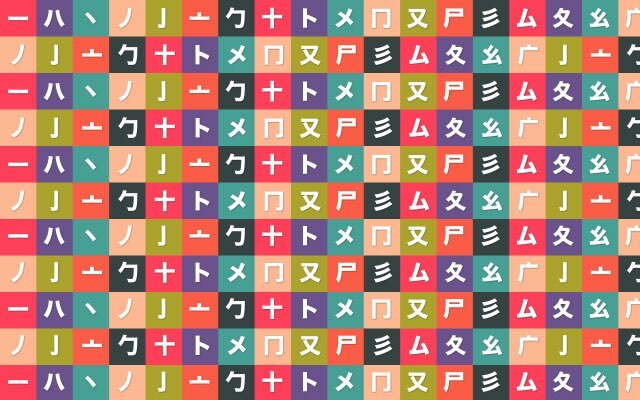 Around five years ago, Tofugu made the kanji-learning application WaniKani to fix the "learning kanji" problem. Since then, we've seen students learn all 2,000+ jouyou kanji (not to mention 6,000+ vocabulary words) in just over a year. You don't need to spend 10+ years studying kanji to reach a decent level of Japanese literacy. One or two years will do, if you've got the right technique. 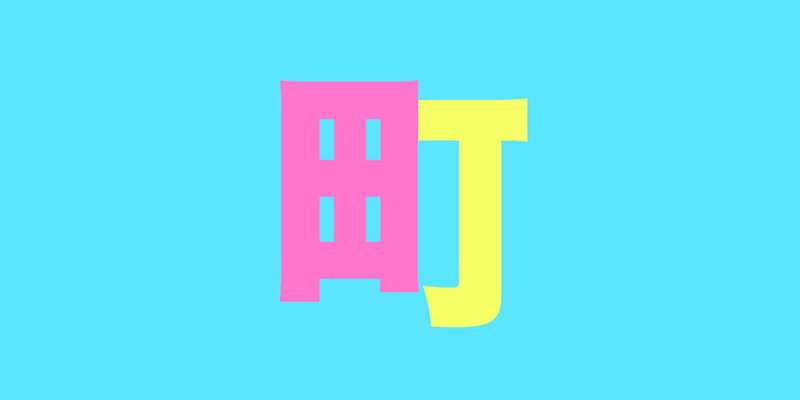 In this article, we're going to give you the recipe to our secret sauce so you can do the same, no WaniKani necessary. Even if you think you're "bad at kanji," you'll see a five to tenfold increase in your kanji learning speed the moment you get to the bottom of this page. A pretty good reward for fifteen minutes of reading time, don't you think? Not everyone can afford to pay for WaniKani (around $7-9/month). We want to give these people another option. If someone wants education, they should be able to get it. If you create a free WaniKani account, you can use WaniKani levels 1–3 for free (that's 100+ kanji, and 300+ vocabulary words). By that time, you've learned everything in this guide and more. People don't stick with WaniKani because we keep the method a secret. They stick with it because it's hard to quit (some say "addicting"), it's simple (sit down, follow the instructions, and you will make progress), it has a huge community of like-minded Japanese learners (though sometimes they're a bit weird), and it's an all-in-one solution (SRS, ordering, and more). We want more people to know about this method. It's existed in various forms for nearly 50 years, but very few people are using it. Tofugu has a unique opportunity to spread the word and help out teachers, students, and everyone in between. 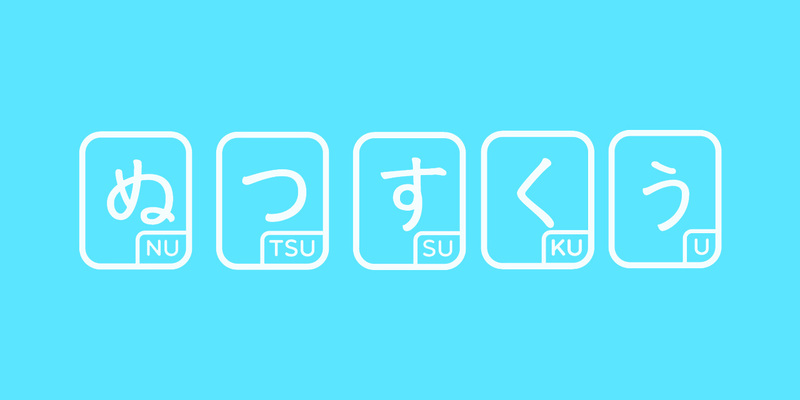 We want to move the Japanese language industry forward, because it's been stagnant for a long time. That being said, what do you get from this guide? If you're a student, you'll discover the secret to learning 2,000+ kanji in one to two years. If you are extremely motivated and have a lot of free time, maybe even less than that. 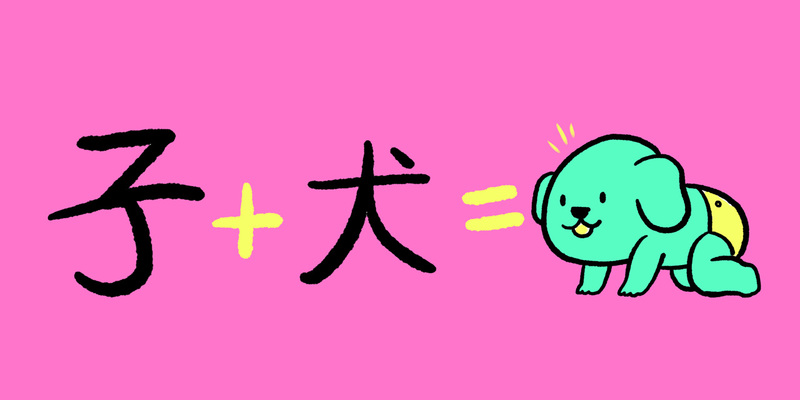 If you're a teacher, you'll learn how to teach kanji in your class using this method. We'll provide reference materials for you to use, so you can build a kanji/vocabulary teaching method tailored to your teaching needs. Ready to get started? There's a lot to cover, and we're sure you're excited to see some results. Kanji + Kanji = Vocabulary? First, you need to learn what a radical is. 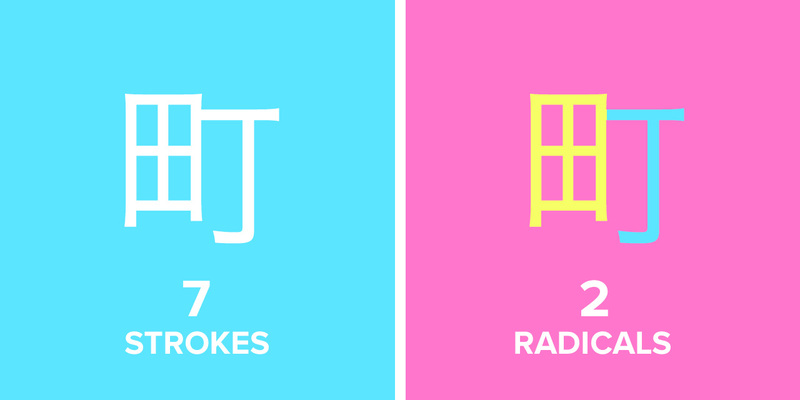 There's a chance you've heard of radicals before – perhaps in reference to looking up kanji in paper kanji dictionaries – but those aren't quite the radicals we're talking about. In this guide, radicals are patterns and symbols that appear inside each kanji. Each kanji consists of 1–3 (sometimes four) individual radicals. Think of them as "building blocks" for creating kanji. When thinking of radicals and their usefulness, you need to think of them as though they were the individual letters of the English alphabet. What did you learn before you learned how to read English words? You learned the letters of the alphabet. Now, try to imagine attempting to learn to read a word in English without having the knowledge of the alphabet at your disposal. It's insane, right? Yet, that is exactly how most people are learning kanji. Learning kanji stroke-by-stroke is like learning how to read the word "stupid" without knowing any of the individual letters. You would have to memorize the spelling as "that snake shape, plus that cross shape, plus…"
You get the picture. It's stupid. Multiply that by thousands of different words, and you will understand how inefficient this method is. To learn this kanji using the radicals mnemonic method, you need to know the names of these two radicals first (we'll teach you how to learn kanji radical names later on in the guide). See the two radicals? Okay, good. Let's move on to the next example. In this case, we need three radicals to build this kanji. Usually we try to prevent a kanji from having more than three radicals, though occasionally you'll see a kanji made up of four or (very rarely) five radicals. See where all the radicals are? Great. Next example. It's also possible for kanji to have only one radical, which means the radical and the kanji are the same! The kanji 大 means "big." And in this case, the radical 大 also means "big." There are cases where the radical name and kanji name are different. We'll talk about that later on. Through the radical mnemonic method, we'll essentially skip the short-term memory step, putting kanji directly into your long-term memory. For this section, I want you to remember the number seven. Why? Humans can typically remember 6–8 things in their short-term memory. A lot of kanji have well over eight strokes. Traditionally, when people learn kanji, they try to memorize the individual strokes then write them over and over again. Learning this way puts kanji in your short-term memory. By writing it over and over again, it's put in your long-term memory. Sometimes. It's pretty hit or miss. Through the radical mnemonic method, we'll essentially skip the short-term memory step, putting kanji directly into your long-term memory. It won't be a strong memory, but it's much better than short-term, which disappears the moment you stop thinking about it. Let's dig a little deeper: I'm going to compare memorization via strokes and via radicals. It will highlight just how simple the radicals mnemonic method is (and how inefficient learning by strokes is). We'll start with 大, because it's only made of three strokes. That's not so hard, and it falls well within the seven things a typical human can keep in their short-term memory. Three strokes is only three things to remember. But, compare this to the number of radicals needed to build this kanji: one. If you learn via radicals, you only need to remember one thing. The difference is more obvious as kanji gets more complicated. 町 is seven strokes, or seven different things to remember; right at the edge of your short-term memory's capacity. It's doable, but a little more difficult (and it requires your full concentration). 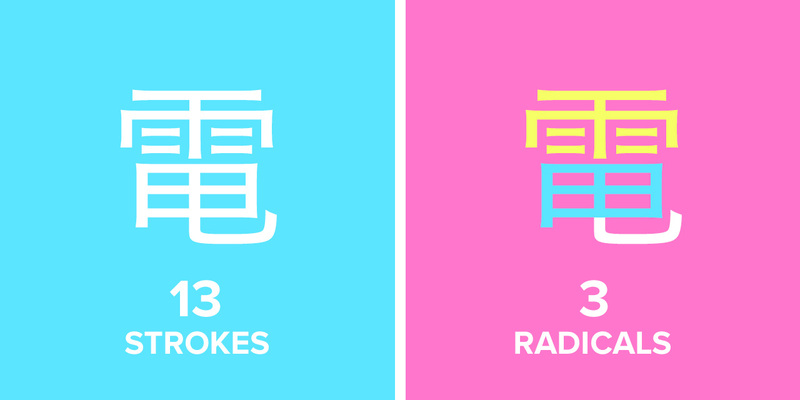 With radicals, you only need to remember two things: 田 and 丁. 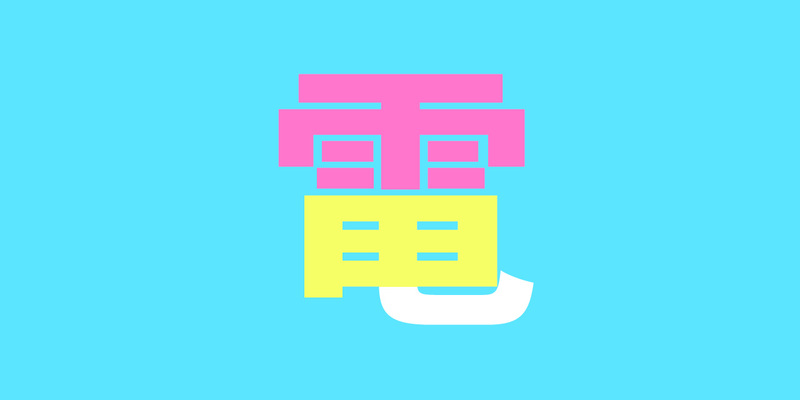 Finally, let's look at the most complicated kanji we've introduced (so far). 電 is thirteen strokes, meaning it's extremely difficult for your brain to memorize via rote memorization. With radicals, you only need to memorize three things. Thirteen vs. three is a huge difference, and kanji get way more complicated than this. My point is this: right from the start – even without mnemonics – the radicals mnemonic method cuts down what you have to memorize by 80%, in most cases. But we're not stopping there. Next you'll see how the addition of mnemonics allows you to stick a kanji's meaning and reading straight into your long-term memory. No more rote memorization. First, let's talk about mnemonics. 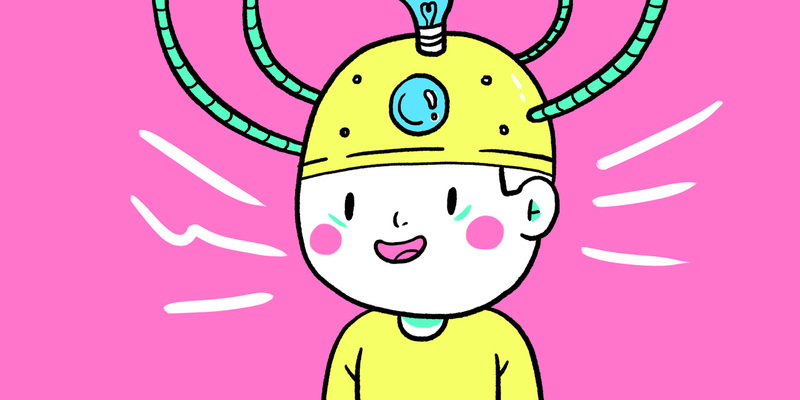 Mnemonics are basically just memory devices that help you memorize something. There are a ton of different mnemonic methods out there, but the one we'll use to learn a kanji's meaning and reading uses stories. This point is important, because stories are what catapults a brand new piece of information (a kanji's meaning) into your long-term memory. Humans, it turns out, are very good at memorizing two things: stories and three-dimensional space. We evolved this way because it helped our survival as a species. If a passing traveler told you a story about a crazy blonde dude that killed a bunch of younglings near XYZ part of the river, you'd most likely be able to recall all of the important details to pass it along to members of your tribe. In ancient times, the ability to memorize a story and pass it along meant the difference between life and death for you and your community. The mnemonic method we'll use to learn kanji utilizes stories. This is important, because stories are what catapults a brand new piece of information (a kanji's meaning) into your long-term memory. Now compare memorizing "important details" of a story to memorizing a string of digits. Even if the number of items to memorize were the same, the story will stick in your mind effortlessly. The string of digits, on the other hand, would take a lot of concentration and won't stick half as well. The radicals themselves are the first step in a mnemonic method that uses this incredible human ability. If you can identify the radicals in a kanji, you can use the radical names to create a story. This story will help you recall the meaning of the kanji. When you need to recall the story (and thus the meaning of the kanji), all you need to do is look at the radicals. These will trigger the story in your mind, and you'll be able to recall it. The easiest way to understand how to do this is to see it in action. Just pretend you've memorized the names of the radicals (for now). You'll actually learn them later on. First, identify the radicals that build the kanji. It's important to come up with a method so that the order of the radicals are the same every time you identify them. While you could use any ordering system you want as long as it's consistent, we recommend you order the radicals by following general kanji stroke order rules. That is, by starting in the top-left and working your way down to the bottom-right. It'll make writing easier, should you ever learn how to write by hand. In the case of 町, the "top-left" radical is 田 (rice paddy), and the "bottom-right" is 丁 (street). Now that we've identified the radicals, it's time to create a mnemonic story. To do this, you need to use the radicals to make a story, in order, so that the conclusion is the meaning of the kanji (for 町 that would be "town"). A rice paddy that's so big a street forms next to it? That's a town! A bunch of rice paddies with streets connecting them form a town. Notice how there isn't a lot of extraneous detail? When creating your own stories, you don't want to add anything that distracts from the radicals and the kanji meaning, otherwise you might accidentally recall the wrong meaning while "triggering" the answer. The story happened in the order of the radicals. We could have done the other order, and in this case it wouldn't have mattered much, but for some kanji it will make a big difference. It's best to be consistent, so you can "read" the radicals in the kanji in the same order as your mnemonic. Let's do this with the other two kanji you've looked at in this guide. Standing in the rain in a rice paddy with an umbrella was how Benjamin Franklin discovered electricity! 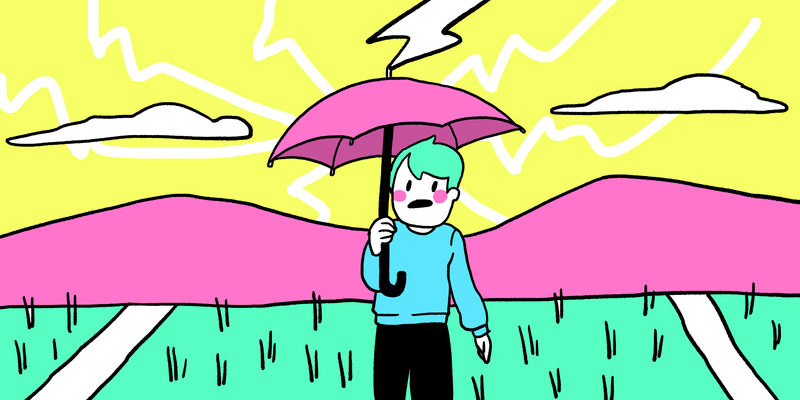 You're standing in the rain in a rice paddy holding an umbrella. Rice paddies are flat, and since the umbrella is the tallest thing it is hit by electricity! You may have noticed already, but the kanji 町 (town) and 電 (electricity) share the common kanji radical 田 (rice paddy). Radicals you learn will be used over and over again, just like the letters of the alphabet. Some will be used more than others (also like the alphabet), but every radical will be used more than once. Okay, lastly, let's look at the kanji 大, which is built with the radical 大. In cases where the radical is the same as the kanji, you don't have to make a story. Just use the radical to trigger the fact that the kanji is the same as the radical. In cases where the radical is the same as the kanji but the radical's name is different, you have to create a story, just like before, to connect the radical name and the kanji meaning. The only difference is you have to create a story from one radical. It's a little obnoxious, but when the radical name is different from the kanji, there's usually a good reason for it (most likely, the kanji meaning is hard to imagine and not good for mnemonics). Now that you understand how this works, let's quickly run through some examples. Go through each kanji, identify where the radical lives in each, and then make your own story (or look at our examples for inspiration). The sun reflects off the moon and makes it bright. The sun and the moon are out? With both their light-powers combined, it's incredibly bright! You give a spirit statue an umbrella in the rain as a show of thanks for always protecting your village. You always take care of your old umbrellas as a show of thanks to the spirits who dwell within them. If you want your spirit to be simple just try Zen Buddhism. They're all about that stuff! Make your spirit simple by being more Zen. Let go of your worldly desires and be free! The fires used to light up the street are lamps. If you want to carry fire with you to find your way on a dark street you'll need to buy a lamp. A grain for every mouth means the world is at peace. Put grains in your mouth with chopsticks, in the Japanese style! The sun is used in the temple to tell time. Clocks aren't allowed in sacred places like this! Go see where the sun falls in the temple. That's how you know that time it is. Your eye's death means you've gone blind. Eye death is the leading cause of blindness in most first world countries. A woman who is about to create a landslide with her body is pregnant. If birth bothers you, just imagine a woman creating a little landslide in her body when she's pregnant instead of all the other stuff. If you start a fire near your syrup it will dry up. What the heck dude! You shot fireballs at my syrup and it dried up! You're the worst! If you see penguins in groups of twenty they're definitely evil, get away from them. No really. The above sentence should be enough. Didn't you see that talking animal movie? The penguins are evil. Hopefully you're beginning to see how these mnemonic stories work and how they can help you memorize a kanji's meaning. But, where are these radicals and radical names coming from? How can you know what radicals are in each kanji? And how can you go about learning them? You're probably thinking. "Isn't it better to learn the ‘official' names? Who do you think you are, Tofugu?!" You have to admit, the names may look like the things they represent, but they don't really hold any meaning. 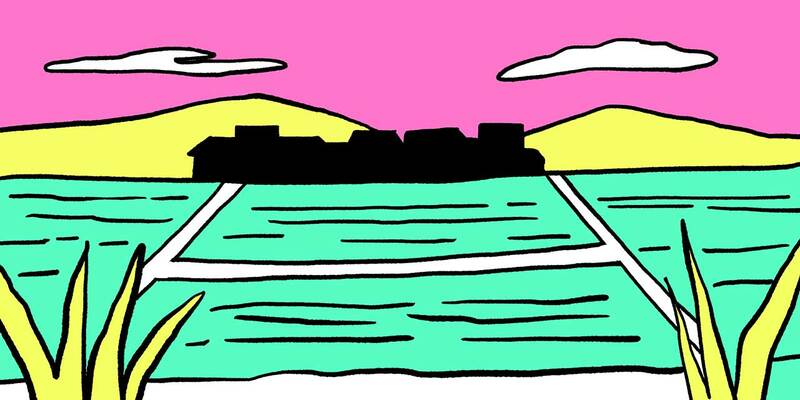 There's nothing you can visualize easily in your mind's eye with "down box." Another problem: they're so similar to each other. It's difficult to differentiate an "open box," a "right open box," and a "down box" in your imagination. Since these radicals are being used for mnemonics in a story, we've renamed them to things that are easier for you to visualize. By renaming duplicates to unique names, it's easier to make easy-to-visualize stories in your mnemonics. You may have realized at this point that we're renaming radicals. Most Japanese people don't know the official names of these radicals either, and if that doesn't illustrate the unimportance of knowing the "official" radical names, I don't know what will. Official names tend to be very general and difficult to imagine in your mind's eye. It's important for mnemonics to be specific and easy to imagine in your mind's eye. What would you say if I asked you, "What's the meaning of the letter ‘s' in ‘stupid?'" Radicals and kanji are a lot like that. Knowing the official meaning of a radical isn't important (and when it is, we keep the official meaning). These tweaks make radicals work how we want them to: as building blocks we can use to remember kanji. For these reasons, and more, we use the WaniKani radicals list. If you really want to, you can use another radicals list if, say, you already started learning with that list. 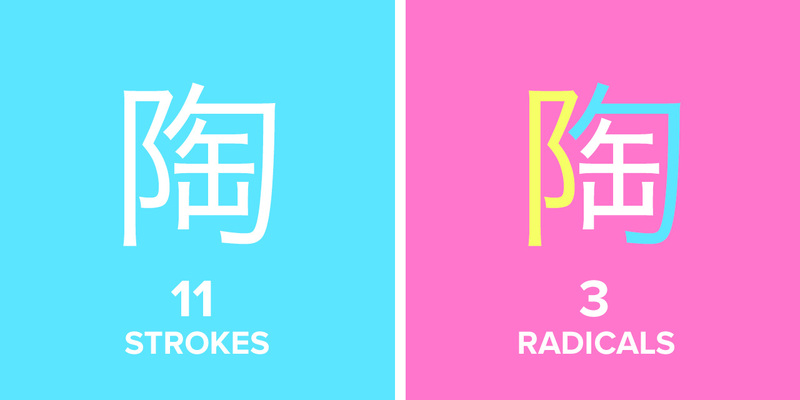 Now that you know radicals have names that are good for making stories, it's time to learn how to identify them, learn them, and use them to make your own kanji meaning mnemonics. Identify the kanji you want to learn. Copy the kanji by highlighting it, and pressing cmd+c or ctrl+c on your keyboard (you can also right click the highlighted word and click copy). 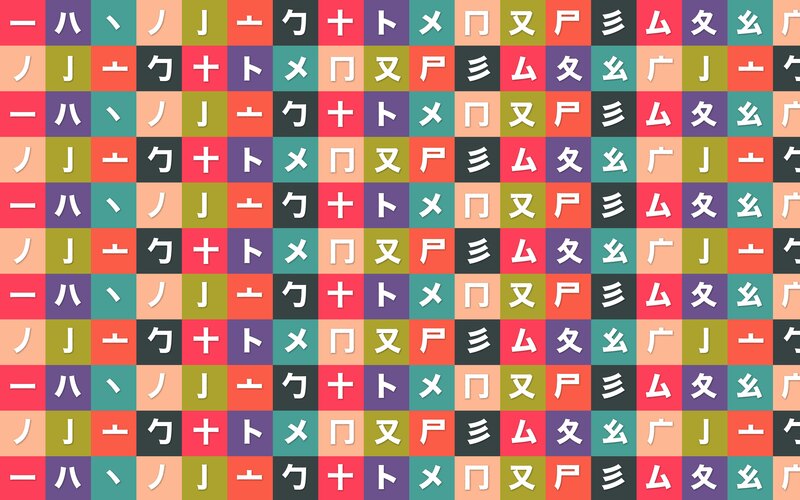 Visit our handy-dandy Kanji Radicals Reference Spreadsheet. Press cmd+f or ctrl+f to activate the "find" feature on this page. Paste your kanji into the "find" field. It will find the kanji in our spreadsheet. If you look at the 盲 kanji row, it will show you what radicals are used to build this kanji. These steps assume you already know the radicals to a degree that allow you to use them in stories. You have to know the names of the radicals well enough to identify them without looking up their meanings. So, the next question is, how should you learn the radicals? In what order should you learn them? When should you learn them? That, we're afraid, is a very difficult question to answer. It's going to depend on the ordering in which you learn your kanji. 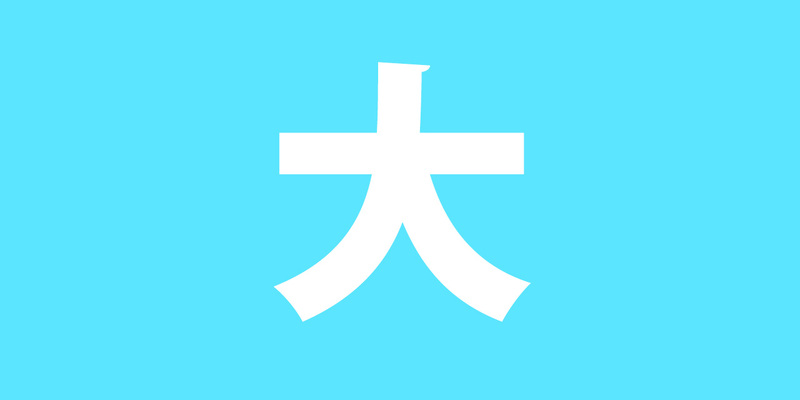 In WaniKani, we introduce new radicals before you learn a kanji that uses those radicals. This way, it feels like magic, and you always have some familiarity with things you've never seen before. We figured out the ordering of the radicals and kanji, and are continually tweaking it to make things more and more efficient. Take a look at the 10–30 kanji you need to learn next and go through each one by one. Identify the radicals used in each of these kanji, and learn those radicals (you'll have to figure out a way to judge when something is "learned"). Then, after you've learned the radicals, learn the meanings of the kanji using your "learned" radicals. Then, repeat. 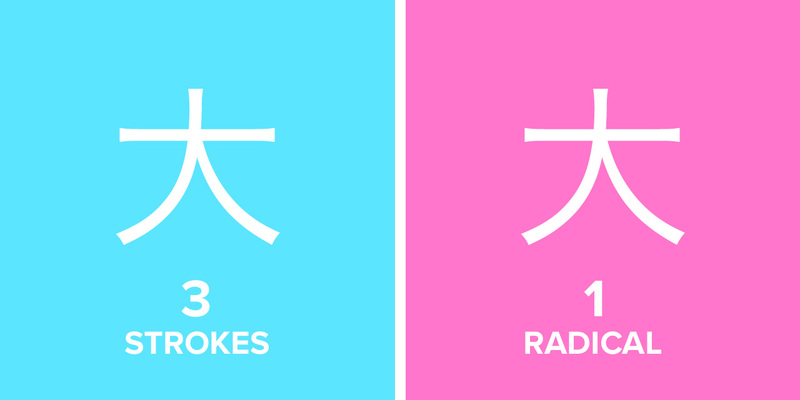 The next set of 10–30 kanji will use radicals you've already learned, and with each set you'll have fewer and fewer radicals to learn. If you're a teacher, the second option is probably the best, though you'll need to do some groundwork to prepare this for your students. If you're a student, then either option is fine, I think, depending on your personality. That said, we've already done all this in WaniKani, so if you don't want to spend time deciding what radical to learn when, that's a third option available to you. Alright, so you've learned how to learn the radicals, and how to use them to make stories that trigger the memory of a kanji's reading. 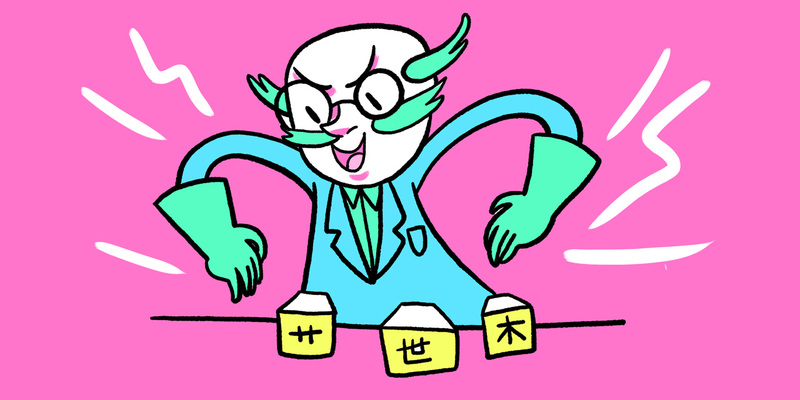 Now you're going to learn how to memorize a kanji's reading by continuing your mnemonic. Most kanji have a straightforward meaning. The popular resource, Heisig's Remembering the Kanji, focuses mainly on learning the meanings of kanji. It sure feels like you "know" a lot of kanji when you finish this book, but the meaning of a kanji is only about one-fourth of the equation. If you want to be able to read (and speak, and write, and listen to) Japanese, you need to learn a kanji's readings and vocabulary too. Readings are difficult, but choosing what kanji reading to learn may be even harder. The traditional method for learning a kanji's reading is to just learn all of them, or at the very least learn an on'yomi and kun'yomi reading. Almost every kanji has at least two ways to read/pronounce it (one on'yomi and one kun'yomi). But, there are also often multiple on'yomi readings and/or multiple kun'yomi readings. Don't even get me started on nanori (readings for kanji used in names)! For most kanji, there is one reading that's better than all the rest; one reading that is used in 80–90% of the vocabulary words that use that kanji. Instead of learning all the readings of a kanji, we recommend choosing one reading and calling it "the reading." For most kanji, there is one reading that's better than all the rest; one reading that is used in 80–90% of the vocabulary words that use that kanji. 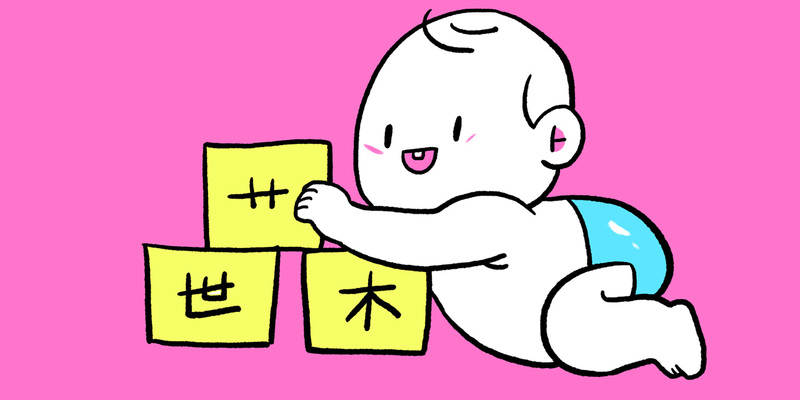 When it comes to mnemonics, it's much easier to associate a single reading with a kanji. If you pile on additional readings to learn, your memory gets mucked up. One reading to rule them all. That's your goal. Economically, one reading makes a lot more sense too. You are doing 20% of the work, but getting 80% of the results. To achieve the other 20% of the results, you'd have to spend five times as much time. You do need to learn that 20% eventually, but you can learn it by studying vocabulary. If you've been initiated into the more "traditional" kanji learning camp, it will take a little stretching to wrap your mind around this. But once you do, you'll find it's a lot simpler, faster, and more efficient. Choose the reading that's used the most in vocabulary. Just search for the kanji you want on jisho.org with two asterisks on either side (for example *大*). This will find all the words that use 大. Go through the results and get an idea of what reading is most useful/what shows up most often. Be careful when looking at words that use the kanji in them, though. Not all words are created equally. Favor words marked with the tag "common." The "common" tag isn't perfect, but it should help. Don't choose a reading that is exceptional (e.g. only shows up for one word), or is rare (e.g. only shows up in a couple words, compared to another reading that shows up more). If you have no idea, just choose the on'yomi reading. It's generally going to be the most useful reading to learn. If there is more than one on'yomi reading, use the steps above to see what reading looks the most useful. Guess. As long as you learn vocabulary (we'll show you how later on), you're going to learn all the readings. Don't stress too much about it, as it will work out in the end. On WaniKani, we went through these steps to choose "the reading" for every kanji you learn so you don't have to worry about it. But, you can choose your own "the reading" too. Okay, so let's assume you've chosen "the reading" for a bunch of kanji. It's time to learn how to memorize that reading with the radicals mnemonic method. It's quite easy, actually. Just continue the story that you created for the meaning mnemonic. Make the story a natural continuation of the meaning mnemonic story so that when you recall the meaning, you automatically recall the reading too. Remember, humans are really good at recalling stories, so this works surprisingly well. After the electricity hits you, you feel your face and there's a huge dent. Ouch! Things only start to get this bright outside in May. Before that month it's always dark and rainy. You show your thanks to the spirit and suddenly a ray gun appears at your feet. Huh. Maybe you should thank the spirits more often. Lamps lining the streets were first invented in Toukyo. That's why the Toukyo we know today is always lit up with new-age lamps all night long! The world is at peace and everyone eats in the new Japanese style, by sticking your chopsticks in your mouth and pretending to be a walrus. Arf arf! Time in a temple makes you think of Jesus. Specifically, Jesus being able to perform time travel magic. He winks at you, goes back to the dinosaur ages, where he wrestles a T-rex. Then, he goes to WWII era and punches Hitler in the mouth. When you're pregnant you hit your shins on things all the time because your belly is so big. You can't look down to see your shins, let alone try to avoid bumping into things. Dry up syrup with fire and, you're removing its soul. Have you ever seen dry syrup before? No soul in that. In fact, you probably have no soul if you can dry up syrup without feeling bad about it. The evil penguins can't let you tell the other humans what you've seen, so they murder you and hide your body in a hay stack. Your family will never know what happened to you. The penguins will get away with their evil plans. By doing this, you have a system for not only recalling the meaning of a kanji, but the reading of a kanji as well. I know recalling the meaning and reading feels slow to you now, but you'll learn how to reach a fluent level of recall later on in this guide. Part of this comes in the next step, as well as the final piece of the puzzle: vocabulary. if you are trying to learn the word 人口, you would need to "know" the kanji 人 and 口. If you don't know both, you shouldn't be learning this word (yet). To learn Japanese vocabulary words, we're going to use a slightly different – yet similar – mnemonic method. Before that, though, we have to answer the question: what words should you be learning? Is the word useful? Is it common? You can use jisho's "common" tag, or you can paste the word into Google to see how often it comes up. You could ask on HiNative. You could check the word against a Japanese vocabulary frequency list (just search for that in Google). Do you know all the kanji in the word? For example, if you are trying to learn the word 人口, you would need to "know" the kanji 人 and 口. If you don't know both, you shouldn't be learning this word (yet). As for how to define "knowing a kanji," that's going to have to be a threshold you decide yourself. We suggest being more conservative on this, because people tend to be more optimistic than they should be when it comes to knowledge. Sometimes a kanji will only have one "good" word worth learning. But, the act of learning vocabulary words helps you to learn the kanji as well. In cases like these, we suggest you add a couple "less common" words to your study stack, because it will help you in the long run. Even "uncommon" words will pop up where you least expect them. You like the word. Hey, that's a good enough reason for me. One thing you can do is search for words in jisho by placing asterisks on either side of a kanji you've learned. For example, you could search for *口* and it will output all the words that use the kanji 口. Use the steps above to choose what vocabulary is worth learning, and once you have identified them you can memorize them using mnemonics (we're going to do that now). The amount of people with mouths (that you have to feed) is the total population you're responsible for. An eye that's also a ball… well that's easy, it's your eyeball. A child dog, or the child of a dog, is a puppy! If something is not good then it must be bad. The war location is the battlefield. It's where you actually fight the war. A dark kill is an assassination. It's done in secret, usually in the dark. Probably by a ninja. The sport you play in a field throwing a sphere is, of course, baseball! You make a face by writing with letters. That's called kaomoji! Oh well, we stole that from Japan, but you get the point. Someone who goes on a trip is a tourist or a traveler. If you go to England and meet people to talk to, you're having an English conversation. The public servant who handles the big tasks concerning things outside your country is the Minister of Foreign Affairs. Someone who wants to preserve, protect, and master the righteousness of the past is a conservative. A car that halts at each station is a local train. If you get on one be prepared for a long ride with a lot of stops. Ah yes. The machine that moves by itself to sell sell sell. 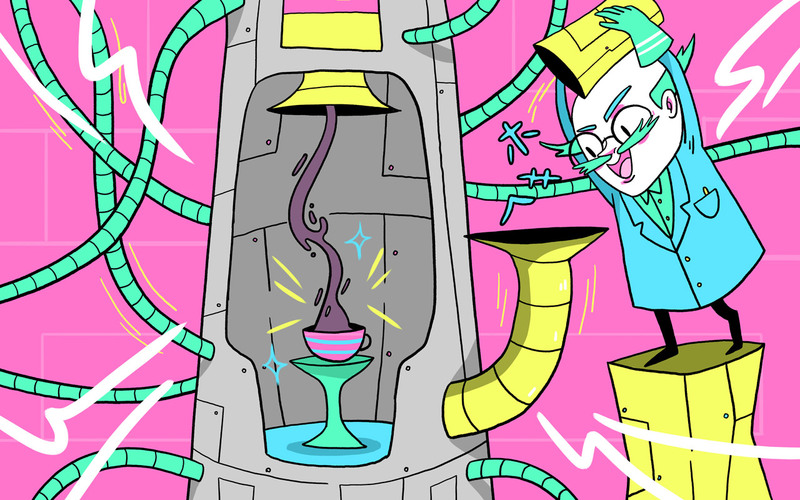 You know it, you love it: the vending machine! Jukugo tend to be pretty easy, with each kanji meaning contributing to the meaning of the vocabulary word as a whole. But, we can do this with other word types too. For example, you know that verbs will end in an う sound. So when you see a single kanji, and some kana ending in an う sound, you can guess that it's a verb version of the kanji's meaning. This is a verb with the kanji for eat, so you can guess it means to eat. This is a verb with the kanji for say, so you can guess it means to say. This is a verb with the kanji for hear, so you can guess it means to hear. This is a verb with the kanji for study, so it means to study or to learn. The verb for your eyes becoming awake is to wake up. Here's another verb. When your heart acquires something, you know it forever. So this means to know. You can do the same thing with adjectives too. As you might know, a good number of adjectives end in い (these are known as "い adjectives"). If you see a single kanji with an い at the end, you can guess that it is (probably) an adjective form of the kanji's meaning. This is an adjective version of big, so you can guess it means big. This is an adjective version of busy is also busy. The adjective version of circle is circular or round. Adding い to the noun white turns it into the adjective white. 々 means the kanji is happening twice, so the adjective version of young young is youthful. And lastly, there are times where you just see a vocabulary word that is a single kanji sitting there all alone. When this happens, the meaning of the vocabulary word is usually the same as the meaning of the kanji. And it's usually a noun. Of course, there are exceptions to all of the "rules" listed above. There are a lot of vocabulary words out there, and you're going to run into plenty of inconsistencies. When this happens, just be flexible and do your best to memorize these words however you can. In rare instances, you'll just need to learn a word through rote memorization (gasp!). For the most part, the methods above should allow you to memorize any word to the point where you can recall it without cheating. You've learned how to memorize a kanji meaning, a kanji reading, and associated vocabulary words. You've also learned how to choose what radicals and vocabulary to learn and when. Using these methods, you can now put radicals, kanji, and vocabulary words into your long-term memory. But, the memories are still shaky. You still need to put in the work to transition those memories from "need to use mnemonics to recall them" to "fluent" (pops out of your mind with no thinking at all). First off, I want to remind you about the ordering. I don't know what kanji you're going to learn and when, but you always need to follow the "radicals → kanji → vocabulary" pattern. Radicals are the building blocks for learning the kanji. Kanji are the building blocks for learning the vocabulary. You have to police yourself and only learn radicals/kanji/vocabulary when you're ready to learn them, otherwise your system will spiral out of control. As for what "knowing" something is… once again, that's going to be up to you. WaniKani knows when you "know" an item, so it can serve you the right items at the right time. But if you're studying on your you own, you have to decide this for yourself. The spaced repetition system is probably the most important part. This is how you go from your first stuttering steps to fluency. Secondly, you need to have a system to learn these radicals, kanji, and vocabulary words. This is probably going to be some kind of spaced repetition system (SRS), like Anki or Memrise. WaniKani has SRS built in and unlocks items automatically. You're never allowed to move forward until you've proven that you know the foundational items first. But if you go with one of the other SRS options (the best ones are laid out in this guide), please make sure you keep these points in mind. Be strict! The spaced repetition system is probably the most important part. This is how you go from your first stuttering steps (having to think for a long time and recalling the answer with the mnemonic) to fluency (the answer coming out of your head automatically). It will take a long time to bring one item to this "fluent" state, but SRS is what elevates this process to maximum efficiency. When you're learning hundreds or even thousands of different items, SRS is a godsend. You just have to add the items and do your reviews when it tells you to. I know that all this seems like a lot of work (and it is). In the short-term, it will feel like you're spending a ton of time not learning anything at all. But you have to look at the big picture. If you learn kanji this way, you'll reach the end goal ten times faster. You have to believe in the system, and force yourself to make a little progress every day. You'll see some gigantic gains after about a month. Stick with it, and your future-self will thank you. I'd also like to note there are communities and resources out there that will allow you to skip some of the manual, time-consuming steps mentioned above. Heisig's Remembering the Kanji is good at teaching kanji meanings and not so good at teaching the readings. But there's a community of learners which has fixed this shortcoming by making and sharing reading and meaning kanji mnemonics for Heisig's at Kanji Koohii. Another alternative, which does both meanings, readings, and vocabulary, is Kanjidamage (NSFW). Pair the Kanjidamage information with SRS and it becomes pretty powerful. Finally, there's WaniKani, which does everything in this guide and more. 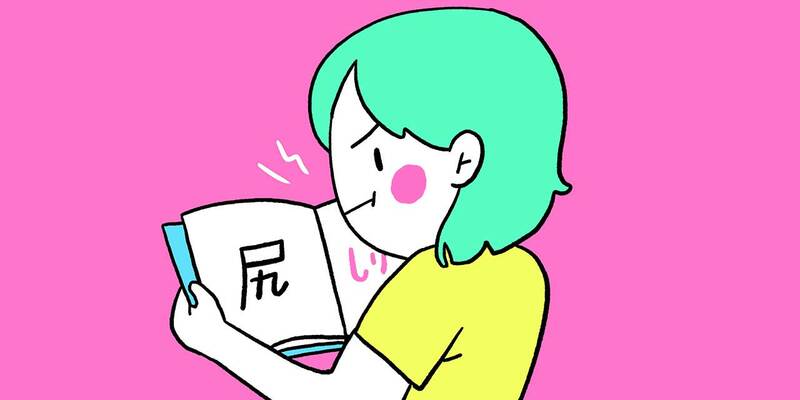 If you sit down and follow the instructions, your kanji and Japanese vocabulary knowledge will move forward every single day, and it will feel like magic. Whoever you are, you can do it. I know it's a big endeavor, but you can learn kanji, and you can do it in (way) less than a decade. Many small actions will get you there, so take the first step right now. If you're having trouble doing that, or if you have any questions, you can always shoot us an email. We'll do our best to help you out.